I found Monster Hunter 3 Ultimate to be something of a revelation. The series had intrigued me, but I had never encountered it on the right system so I had never played it. I let myself be talked, thanks to word of mouth and a nice deal Capcom set up, into buying both the 3DS and WiiU versions of the game. (Actually, I did pick it up for Wii as Monster Hunter Tri just a few weeks before the 3DS and WiiU versions were announced, so I’ve never actually played that version) As much as I ended up enjoying MH3U, my save file has somewhere in the neighborhood of 300 hours on it, I wasn’t too happy with that choice. Almost all of my time with the game was spent with the WiiU version, the one with online multiplayer and able to be played on the big screen so as to enjoy the spectacle of the monsters. The 3DS version simply felt cramped in all respects. Thanks to my experiences with that game I was a little hesitant about jumping on Monster Hunter 4 Ultimate. 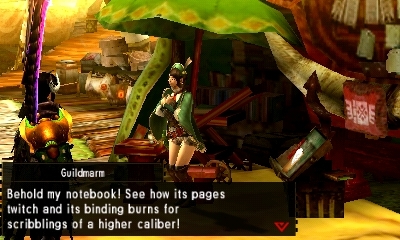 It looked good, but I really didn’t enjoy my previous 3DS monster hunting. Now I’ve had MH4U for the better part of a month and I am very happy with my purchase. MH3U is the rough draft of a great game; MH4U is the final draft of that great game. It is a masterpiece. There are tons of ways it is a better game. Part of it is because I am now playing this on a 3DS XL. It is likely even better on the NEW 3DS XL, but I am not in a position to drop the money on that. Another reason is that this game is designed from the ground up for the 3DS. MH3U was a Wii game crammed onto inferior hardware. The 3DS is capable of ports from that system, but not without compromises. The upcoming Xenoblade port requires the extra processing power of the NEW 3DS. While the game played alright, it wasn’t quite right. While MH4U isn’t a big leap in graphical quality, being designed for the system it does more with the power that the 3DS has to offer. It is not a great a change, but a noticeable one. Also, this game adds online on the 3DS. The one biggest way that the game improves on all versions of its predecessor is that it gets rid of swimming. Swimming was a decent idea and does have some fun battles that make use of it. I do find that I miss the Lagiacrus. However, the controls in the water, especially on the 3DS without a second stick, are frustrating. It made an already cumbersome game downright unwieldy. Honestly, even on the WiiU I found myself putting off missions with swimming as long as possible. 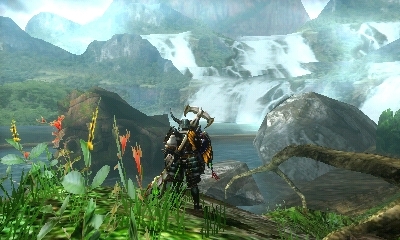 Without the swimming, MH4U becomes all the more playable. It’s disappearance from this game is no loss. Despite losing those aquatic monsters, MH4U has a much better and more varied stable of monsters to hunt. 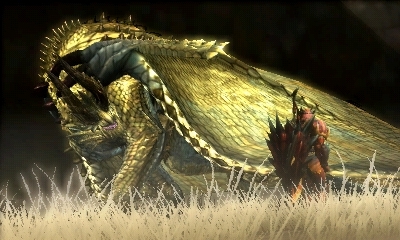 It is not just dragons and dinosaurs; MH4U also has giant bugs, massive apes and even a monstrous hermit crab. On top of the variety being better, there are also simply more monsters, jumping from somewhere around 75 to closer to 90. Not all of them are great, but there are tons of fun fights to be had. Since 3 was the only game in the series I’ve played to this point, I don’t know which monsters a new and which ones just missed the last game. The quest structure is also improved, with fewer required trivial missions, like tracking down mushrooms or gathering honey. They are still there, but they are mostly optional. It also does a better job of doling out new monsters to fight. More beasts are available in Low Rank, though plenty are still held out until the player reaches High. Rare is the time that the game doesn’t have a new monster available to fight. It also adds some mission to help people trying to grind drops from specific monsters with Hunt-a-thon quest, where the player hunts one monster over and over until time runs out. 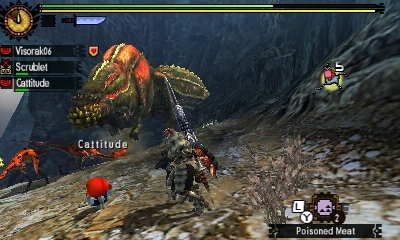 It is also quicker to give mix and match quests to hunt two different monsters. In all, the quests are just much better balanced. Monster Hunter is an odd duck of a series. It has an odd mix of realism and video game logic. The quests and areas are all very video game like, but it also makes the player hunt down ingredients and cook their own food. The way it makes players track how they are wearing down the monsters during a fight, watching for signs of tiredness or rage, seems kind of realistic, but the carving and building armor is very video game. It is an action RPG that is simultaneously all about getting better stats and being very skilled at playing the game. It has a little bit of everything. The cherry on top of the delicious sundae that is Monster Hunter 4 Ultimate is how charming the localization is. This game puts the player with a caravan traveling across the world, in each stop the monsters the player hunts helps improve the caravan’s services and mode of transportation. Sometimes new characters join up until you finally reach your destination. The player’s fellow caravaneers are a lively bunch. Watch any of the games enjoyable but highly unnecessary CGI movies will help set the tone. The Guildmarm, the woman who tracks the player’s quests, is delightfully daffy. The blacksmith, named simply The Man, is great in his quiet competence, as is the cook with his incompetence. It is just a fun crew that makes great use of the little dialogue there is to be enjoyable. Monster Hunter 4 Ultimate is just an excellent game. The joys of fighting and crafting just never end. This game keeps trickling out the rewards and new experiences over what will surely be hundreds of hours.